Dental whitening lightens teeth and helps to remove stains and discoloration. Whitening is among the most popular cosmetic dental procedures because it can greatly improve how your teeth look. Most dentists perform dental whitening. Whitening is not a one-time procedure. It will need to be repeated from time to time if you want to maintain the brighter color. Prior to carrying out the Dental whitening procedure you would have a consultation with your dentist to make sure that you are suitable for teeth whitening and to explain possible risks and side effects of the procedure. Most dental practices will ask you to sign a teeth whitening consent form to confirm that you have fully understood the procedure and all risks. Before the dental whitening process is started a dentist or a hygienist will thoroughly clean the teeth, removing any surface stains and tartar. This procedure is commonly referred to as a scale and polish. It is very important that your dentist isolates your gums and lips with a protective material in order to avoid any potential damage or burning. 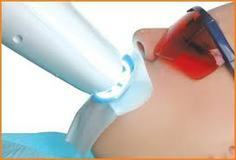 Using a special light with a whitening gel, this is an in-office bleaching system. It is often followed up with an at-home bleaching kit if needed. The translucent bleaching gel is applied to the teeth and a specail activating light source is used to activate the crystals to absorb the energy from the light and penetrate the teeth enamel to increase the lightening effect on the teeth. The length of time in the cosmetic dentist's chair depends on the degree of discoloration you have, but two hours is common. A whitening strip is fitted over your upper and lower teeth. You'll wear them for a half hour to one hour once a day depending on the brand. This is the most common technique because it's easy to use and costs less. The strips are comfortable and have no trouble staying in place. Speaking is slightly awkward while wearing them. While some results may be seen in a couple days, it usually takes one week for the faster strips to one month for the slower systems for you to see the full whitening of your teeth. This procedure is sometimes used in conjunction with the in-office laser bleaching if you have severe discoloration (dark grey or purple) or internal teeth staining. Whitening is not a permanent solution. The stains will come back. If you smoke or consume a lot of staining foods or drinks, you may see the whiteness start to fade in as little as one month. If you avoid these sources of staining, you may not need another whitening treatment for 6 to 12 months. Re-whitening can be done in the dentist's office or at home. If you have a custom-made mouthpiece and whitening agent at home, you can whiten your teeth as frequently as you need to. Discuss your whitening schedule with your dentist. You can talk about what whitening products would work best for you. Having you teeth whitened with high-quality products will give you a whiter smile quickly. It will remove any stains that are on your teeth, even the deep ones that you can't get rid of at home with an over the counter teeth whitener. The level of whitening can be adjusted to your own special needs. Another teeth whitening benefit to consider is that it is easy and painless to do. It is nothing like going to the dentist to have a tooth pulled or filled and having to take a shot. It doesn't hurt and there is no need for anesthetics that numb your mouth and taste bad. There is no need to fear going to the dentist to have your teeth whitened. Dental whitening is unlikely to cause serious side effects, although some people's teeth may become more sensitive for a short while. You may get mild gum irritation as well. Women should not have their teeth whitened while pregnant. The effect of the whitening materials on the development of the fetus is not known. Since the procedure is cosmetic, it should be postponed until after delivery. The simplest alternative to Dental whitening is to alter your habits and lifestyle to reduce staining. Reducing the consumption of any food or activity that might stain your teeth, such as smoking cigarettes or drinking coffee, is one easy step to reduce staining or preserving the effects of a whitening treatment. Another easy way to can help to prevent and reduce topical staining is to make regular trips to your dentist, as well as carefully maintaining dental hygiene, including thorough brushing, flossing and use of a mouth wash. Recently in India the rise has seen in Dental whitening because the costs have dropped drastically, making world class treatments affordable for everyone and patient also get to enjoy a free holiday as well! If a patient has always wanted Dental whitening or any other procedure, he can now afford it, as dental procedure costs have tumbled in India. Dental surgery costs are combined with holidays and this is one of the fastest areas of growth in medical tourism. Indian dentists offer you custom made solutions for all your dental problems. 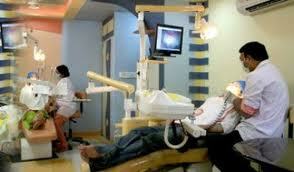 India offers a wide range of dental treatment. The dental treatment techniques have now become so advanced that the patients get it done without pain. The specific clinic where you’re whitening is performed. The location of the clinic. The skill of the dentist performing the treatment. Indian Healthguru Group provides comprehensive medical services to international patients for Dental whitening in India at low cost. Indian Healthguru Group is the leading medical tourism company in India providing the best medical services to its international patients. Patient just has to send a detailed query about the dental whitening and his/her conditions and soon he/she will be contacted by and Indian Healthguru Group assistant. That assistant will answer you query in detail and guide you with the rest of the procedures to get the surgery done in India.